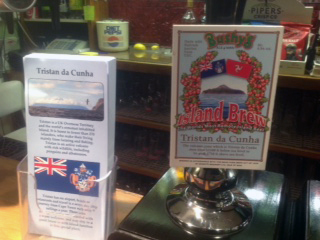 Bushy's Isle of Man Brewery has created an 'Island Brew', infused with Tristan Island Berries, in a joint project with the Tristan da Cunha Government . A 'Twinning Night' was held on Friday 2nd December 2016 between the Albatross Bar, Tristan and the Elder Tree Inn, Horsington, Lincolnshire, England. 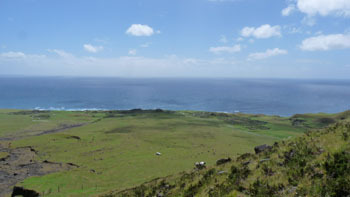 It marked the first sales of 'Island Brew' beer at a UK pub. 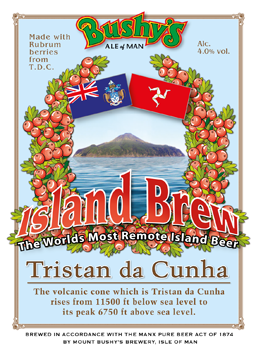 'Island Brew' is brewed in the Isle of Man by Bushy's Ale of Man and infused with Rubrum berries from Tristan da Cunha. The event in the Albatross Bar, which is housed in Prince Philip Hall, was a very enjoyable evening and was well attended. 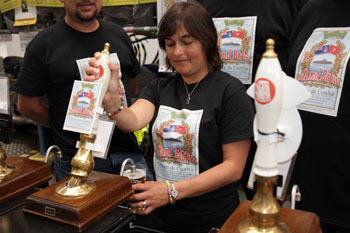 Although we were unable to sample 'Island Brew' at the Albatross Bar, Robin Repetto brought along some home brew beer for everyone to sample, made with equipment supplied by Bushy's. 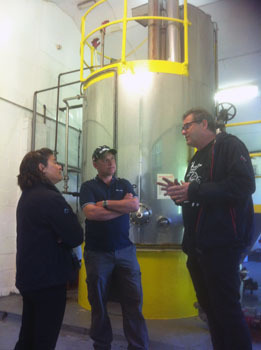 While Robin was in the Isle of Man he had the opportunity to visit some homebrewers and under advice from Martin Brunswisler (Bushy's Manager) has started brewing different beers on a very small scale. 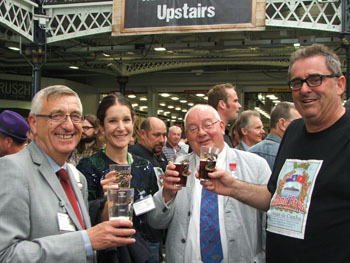 We had the opportunity to sample lager, stout and a hooch which was enjoyed by all. 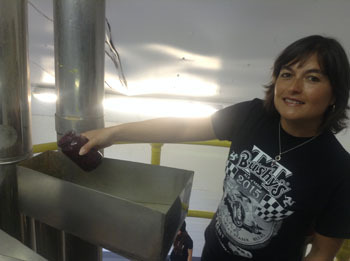 Tourism Officer Dawn Repetto and her husband Robin prepare pour the first of the island's own-brewed beers. 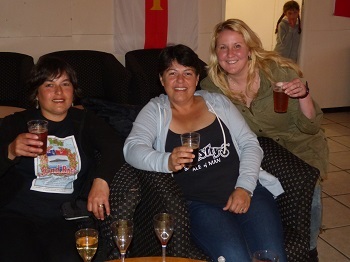 Tristan islanders raise a toast to what is now their twin pub in Horsington and its customers. 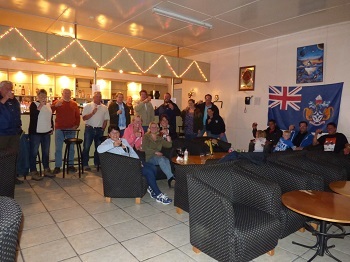 Tristan islanders raise their glasses to their twin pub in Horsington. 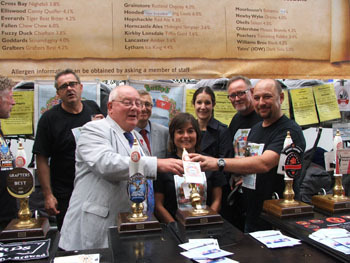 Big thanks to Richard Brown, manager of the Elder Tree Inn, Chris Bates, Tristan's former UK Representative, and of course Bushys Brewery for pulling together this lovely evening and brewing a very fine beer 'Island Brew'. 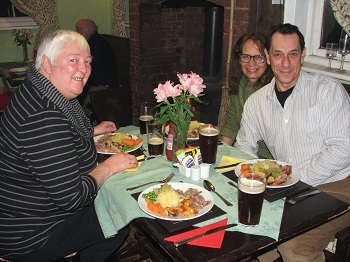 Tristan-born Ian Brown (no relation to the landlord) and his wife Mandy travelled from their home in Buckinghamshire to sample the 'Island Ale' and the traditional Tristan dish of stuffed lamb which had been prepared and brought with them another Tristan delicacy, milk tart - all greatly enjoyed by the patrons of the Elder Tree Inn. 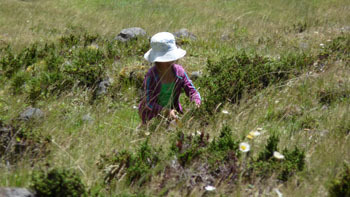 Ian told people in the Elder Tree that he remembered picking the Rubrum berries on Tristan's mountainside as a boy, before moving to live in England. He thought the beer and the lamb were delicious and the pub's customers said the same of Tristan milk tart! Meanwhile on Tristan, toast were drunk to people of Horsington and the two hostelries are now twins! 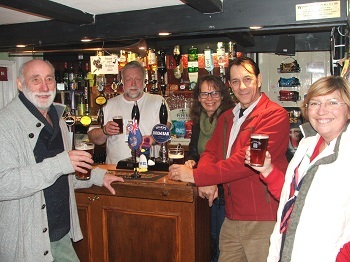 Above: In the Elder Tree, Landlord Richard Brown with Tristan flag and leaflets, serves Horsington resident John Butters (left), visitor Mandy Brown (to his right), Tristan-born Ian Brown (visiting from Buckinghamshire) and Horsington resident, Kathryn Butters (right). 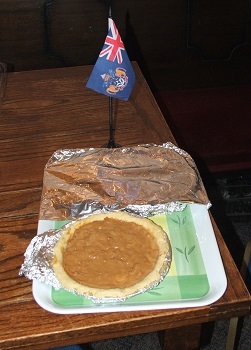 Below: Tristan delicacy milk tart ready for Horsington appetites, with island flag. 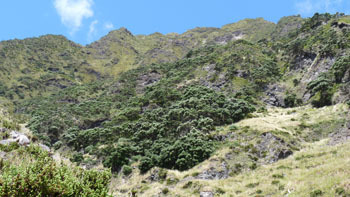 Some samples of 'Island Brew' were sent to HRH The Duke of Edinburgh, after which Prince Philip Hall is named, as he is known to take a keen interest in Tristan. 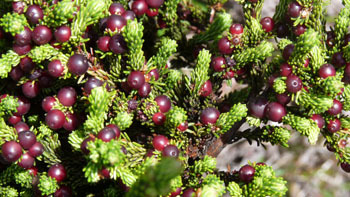 Further supplies of 'Island Brew' to Horsington may have to wait until more Rubrum berries are delivered to Bushy's, but in the meantime, Richard Brown says the Tristan recipes proved so popular that he hopes to serve them again. 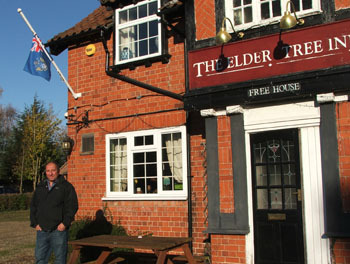 Former Tristan Government UK Representative Chris Bates hosted a visit from Chief Islander Ian Lavarello early in November 2016 (See CI Europe Tour 2016) which included a visit to Chris' local, the Elder Tree Inn in the Lincolnshire village of Horsington. In his honour, landlord, Richard Brown, flew the Tristan flag outside the pub to mark the occasion, shown in the photo left. From 2nd December 2016, the Elder Tree Inn will have on sale draft Tristan Island Brew for the first time. get to Horsington early to ensure you're not too late - for once it's gone, it's gone! Cheers! 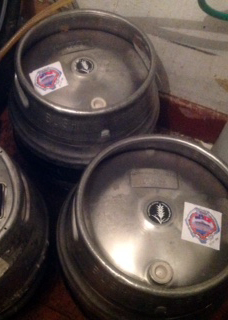 Photos taken by Chris on 27th November Show the newly arrived barrels (left) and the bar tap ready with the Island Brew logo ready for the first pulls on 2nd December. The final moment of the 2015 Overseas Territories Joint Ministerial Council brought Tristan's signature products to centre stage. A reception in the Foreign Office saw Overseas Territories minister James Duddridge give the valedictory speech. 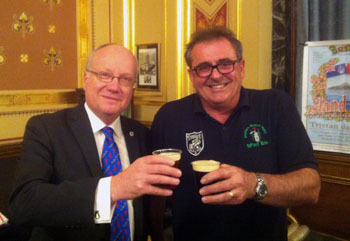 The photo shows Chris Carnegy with brewmaster Martin Brunnschweiler from the Bushy's Ale of Man Brewery which produces the Tristan Island Brew. 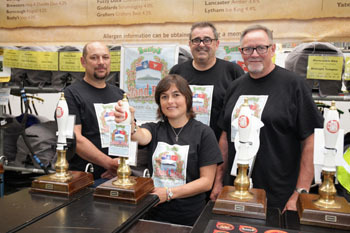 Bushy's was a guest beer at the Albatross Bar in December 2015 - read Dawn Repetto's report of the appearance below, and then go to The Albatross Bar page for more photos. 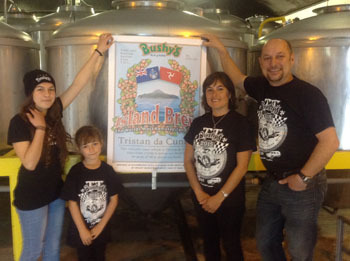 As our readers are aware Tristan took part in a joint venture with Bushy's Brewery in the Isle of Man to make an Island Brew Beer. 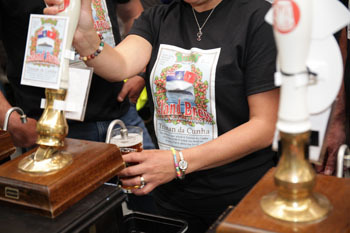 This was a great success and has been enjoyed around the UK and in the Isle of Man. 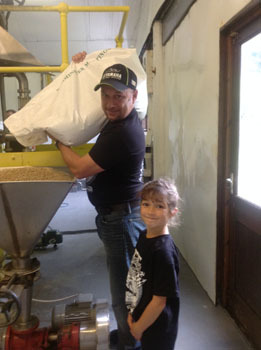 Unfortunately due to the beer being on draught we were unable to get the Island Brew shipped to Tristan. 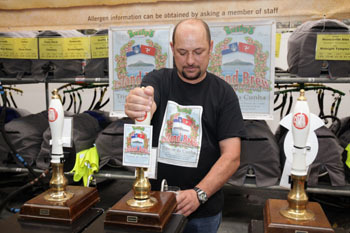 Bushy has made many different draft beers and have even had some bottled. A few of these lovely bottled beers were shipped via Richard James International in the UK, onto Cape Town and then all the way to Tristan. After thousands of miles it was stored away for a special occasion. The first opportunity was the annual Sheep Shearing Day when two bottles were brought out for the occasion. After shearing was completed the two bottles were enjoyed by a few of the locals, the weather was hot so the cold beer went down really well. 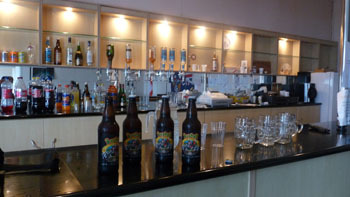 The remainder of the bottles was taken to the Albatross Bar and special permission was given to drink it there. 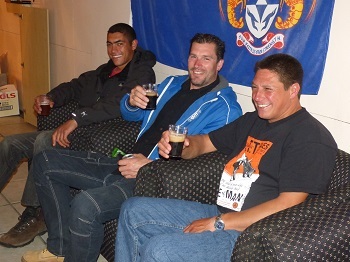 Islanders that had been to the Isle of Man, the Administrator and Chief Islander all met and had a taste of the Bushy's beer. It was a great opportunity to reminisce about the time each person had spent in the Isle of Man. 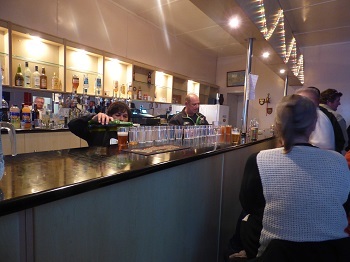 The Bar Manager was so pleased that Bushy's beer had made it here she asked if the empty bottles could be kept at the bar as a souvenir. 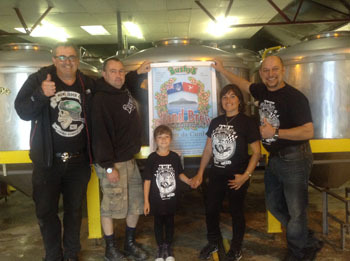 It has been a great privilege to be involved with Bushy's Brewery and to meet the Manager Martin and his team. We look forward to welcoming Martin and his wife Debbie to Tristan in April aboard the RMS St Helena. 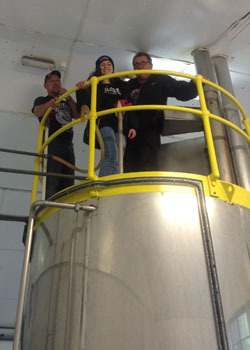 Even though Martin will only be here for a few days we hope to seek further advice from him about the possibilities of setting up a mini brewery on Tristan. 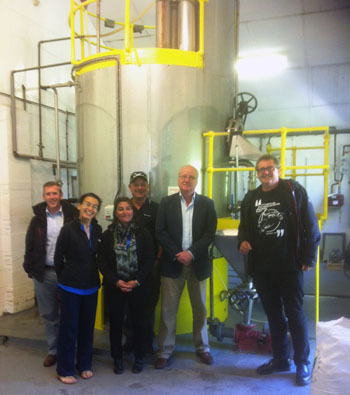 We now look forward to the future and hope to do more joint ventures together.